Those pictures were taken in London where two of my sons are living. I did this lap quilt for my youngest son. 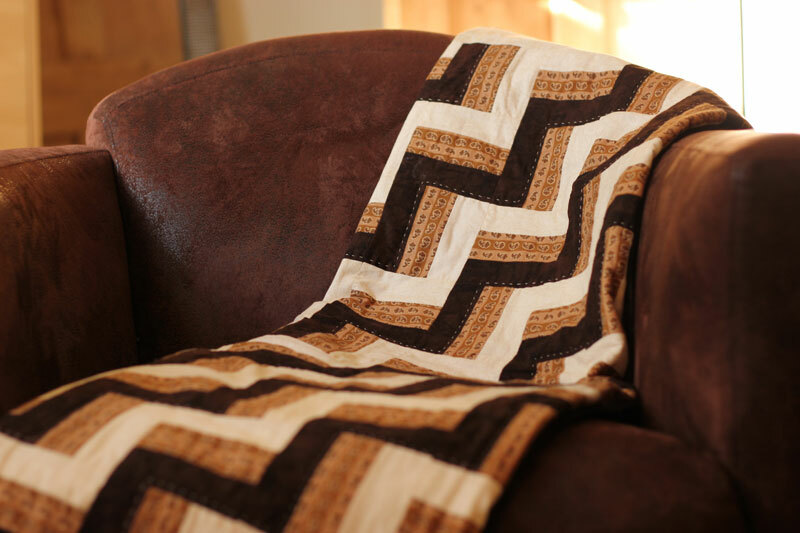 He lives in a cottage and asked me a quilt that would match with the style of his decoration. I understood that I should use brown and beige colors and find a graphic design. I chose the Rail Fence pattern. This is an easy pattern, quickly done. The quilt is machine pieced and hand quilted. The size is about 54" x 54". On the last picture you can see the large brown border. I must say that the result is stunning in the lounge of this cottage and my son and his wife are very happy with it. c'est une bonne idée pour un quilt sobre , j'aime beaucoup. Bon dimanche. Le marron se conjugue bien avec le fauteuil !! J'espère qu'un jour, mes fils m'en demanderont un aussi !! It's beautiful Christine. A perfect manly quilt. I like the pattern you chose to use. Your pictures are always wonderful too. Perfect colors. Great Quilt. You have a gift for combining beautiful colors and fabrics Christine and it makes even this simple style of quilt a standout! 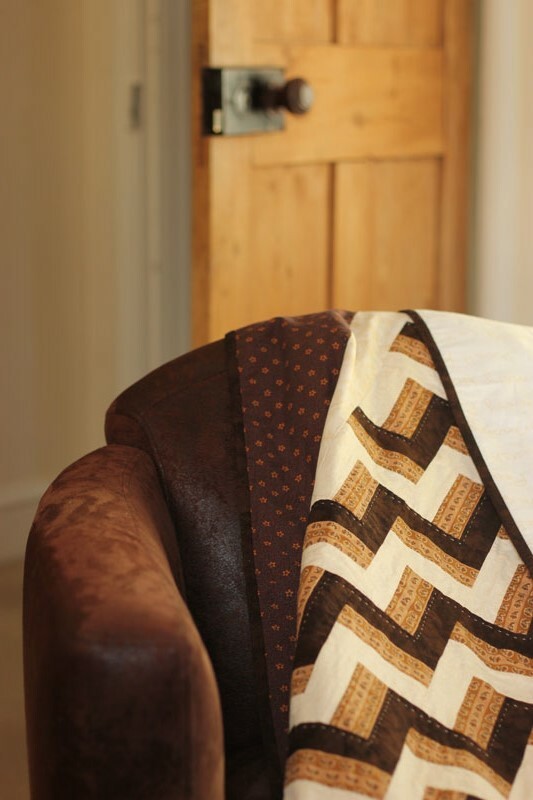 The hand quilting on this is really a lovely finishing touch. It is a very pretty quilt. The colors are very striking! Great! This just proves simple can be stunning! I love it. 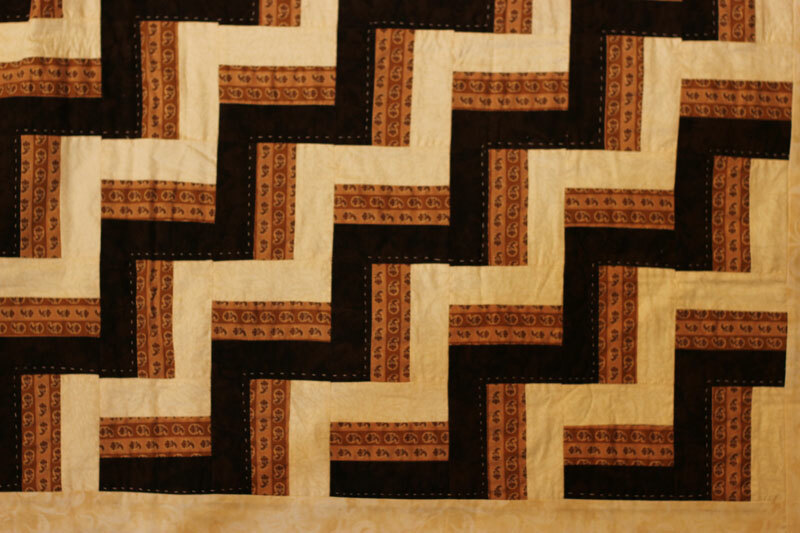 Such a great masculine quilt. I'm sure he loves it! You did a perfect job fulfilling your son's request. SO glad you sharing uner our lap quilt theme as I missed this finish as I was on vacation on the 30th. I I can see why he's happy with it! Good job mom. Wow! It's perfect! I love when it all works out! The best part of giving a gift is knowing your gift makes the recipient happy, sounds like you were very successful, and I can see why! This is a wonderful guy quilt!